While Chick-fil-A will never be open on Sundays, the chain has been expanding in other ways that are sure to stoke the devotion people feel on the other six days of the week. 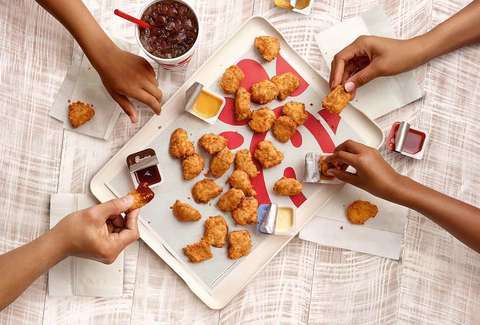 Chick-fil-A recently launched new meal kits meant to take on Blue Apron, has been testing spicy chicken strips at more locations around the country, and is now unleashing five new menu items to kick off fall. These new additions will be available at your Chick-fil-A starting on Monday, August 27, aka are now available, but it's not all chicken variations. Some of these are sides, some are catering options, and, yes, one is just a whole lot of chicken. Clearly, the most exciting addition is the 30-nugget meal. The problem with an eight-piece order has always been that there isn't over three times as much of it, so consider that problem solved. And we promise that if you show up to a gathering with these, you will be hailed as a hero and a visionary. As for the other items, waffle chips used to be exclusive to the catering menu but are now available at the counter. Think of them like a gluten-free kettle-cooked alternative to waffle fries. Also, the fruit cup has been "improved" according to customer feedback "to feature fewer apples and more premium fruit options." There's something really funny about people getting up in arms over the amount of apples in their fruit cups, but good for them for giving the people what they want. The other two items are catering and online order options. 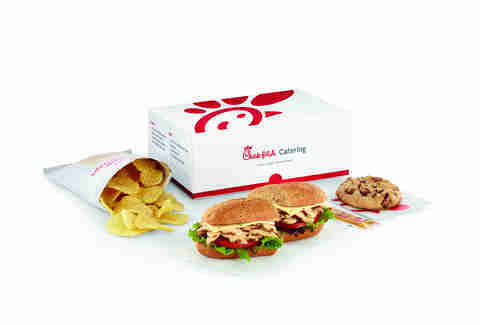 The Grilled Chicken Bundle is basically a build-your-own grilled chicken sandwich kit that feeds 10 and is meant to be a lighter option. The Spicy Chilled Grilled Chicken Sub Sandwich, on the other hand, features a boneless spicy chicken breast "marinated with a special blend of seasonings, grilled, thinly sliced and served chilled on a multigrain baguette with Pepper Jack cheese, baby greens, and sliced tomato" and is meant to be a bit more substantial. But the real takeaway here is that if you order 30 nuggets on Saturday, you'll have enough leftover for Chick-fil-A on Sunday.